Swedish car maker Volvo has started testing of the world's first full-sized driverless electric bus in Singapore from March 5. With capacity for 85 passengers, the bus is equipped with optical sensor and radar, 360-degree camera, and cutting-edge real-time GPS (global positioning system), which is capable of precise positioning with one-centimeter error. The autonomous driving system is protected by online safety system against hacking, which has passed preliminary testing at autonomous driving technology R&D center. 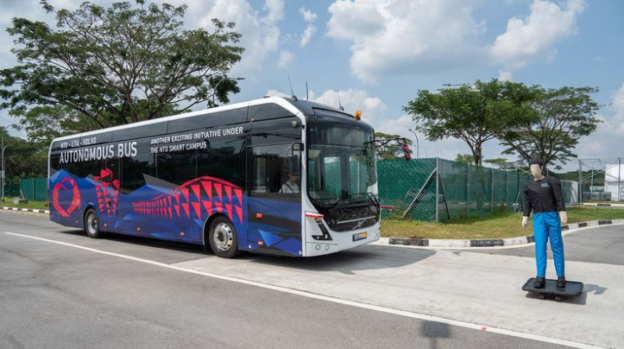 The 12-meter bus, dubbed Volvo 7900, has been developed by Volvo and Nanyang Technological University of Singapore jointly. Hakan Aanevall, chief executive of Volvo Buses, noted that application of autonomous driving technology will alter public transportation system, boosting its safety and efficiency, in addition to alleviating the problem of urban air pollution. The potential of electric cars in alleviating air-pollution problem is especially significant for Asia, where some 4 million people die of the pollution every year, according to a report of the United Nations related in Oct. 2018.